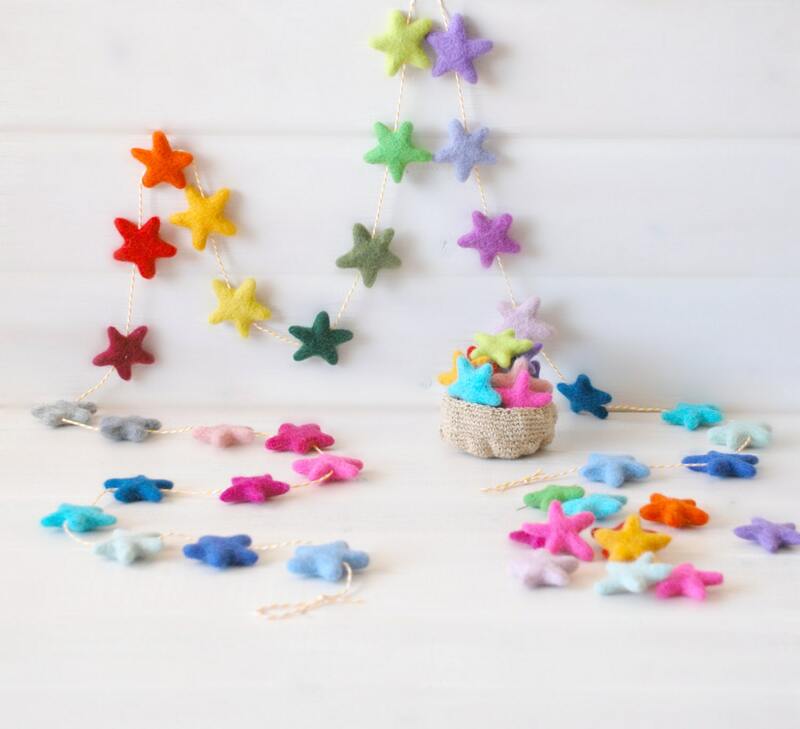 Have fun making your own garland with all of these colorful felt Stars! 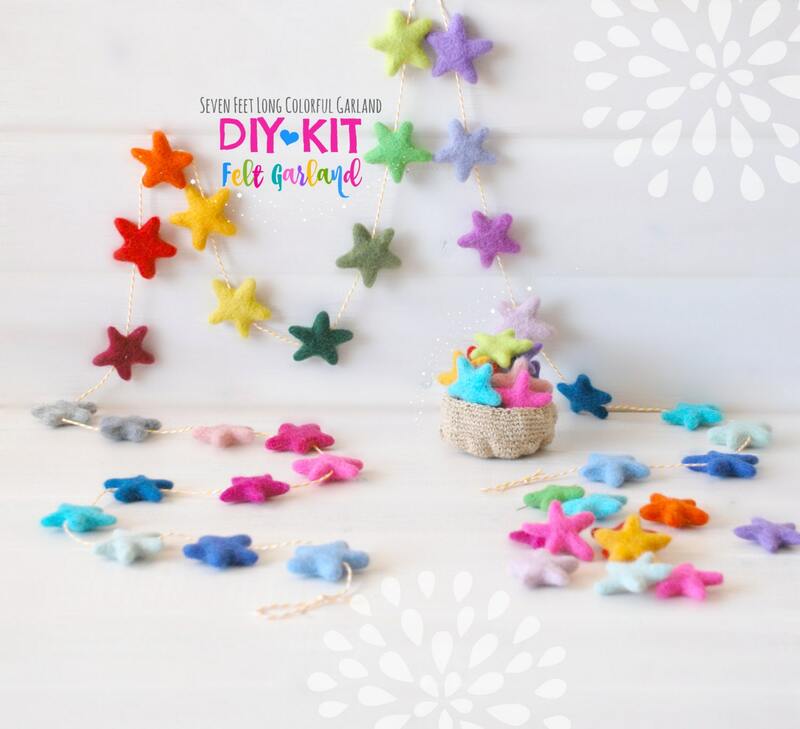 Crafty's DIY garland kit comes with everything you need to make a 7 feet long garland to decor your room or upcoming party! You can make one for every Holiday (Christmas, Thanksgiving, Hanukkah, Valentine's, Halloween, St. Patrick's, etc) or why not... for every season too! Summer, Spring, Fall and Winter! You will be able to make a 7 feet (84") long garland!! Size: Approx. 3-4CM by 3-4CM (being handmade, there is naturally a variation in size within colors; also, some colors tend to be slightly larger or smaller than other colors). ➳"How To" Instructions (1 per Order). * Rainbow Pack: 2 of each color: Pea Green, Apple Green, Celeste, Peacock, Sky Blue, Cobalt, Soft Lilac, Amethyst, Neon Pink, Fuchsia, Yellow, Marigold, Tangelo, Red and Dark Red (If a color is out of stock, I will pick another color for your pack). * Choose 2 Colors: 15 Stars of each color, refer to images 3 to see colors available and Indicate them in the “Notes to Seller” section at checkout. * Choose 3 Colors: 10 Stars of each color, refer to images 3 to see colors available and Indicate them in the “Notes to Seller” section at checkout. * Choose 6 Colors: 5 Stars of each color, refer to images 3 to see colors available and Indicate them in the “Notes to Seller” section at checkout. 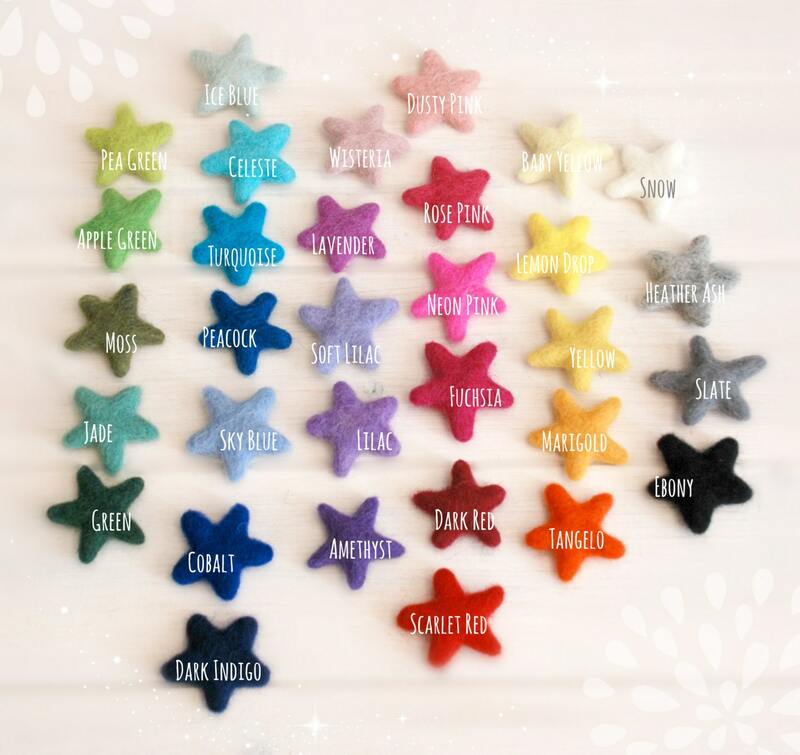 These lovely felt Stars are 100% Handmade in Nepal and are dye with Azo-free dyes. - I try my best that the colors in the pictures represent the colors of the actual product as close as possible. However to do photography as well as monitor color settings a slight difference can occur. - These balls are not safe as toys because they are small enough to be swallowed by children! These are really cute stars. The pictures and description are confusing - don’t order the rainbow pack if you want traditional rainbow colors. The cutest felts I've ever seen!! They look adorable in the daughter's room! Thank you so much! Love it. Quick delivery and quality product! Packaged beautifully and very reasonably priced. Prompt delivery too. Seller was easy to work with when I requested a custom order on the felt stars. Could not be happier with my purchase. Love these! Fast shipping. Thank you!